...and slather it with Kalamata Olive Tapenade. Eat until full, then heat up the rest for breakfast the following morning. It is no secret that I'm fond of leeks. I use them in place of onions in much of my cooking, and a few months ago I discovered the joys of leek fritters (prassokeftedes) from the Greek Jewish tradition. 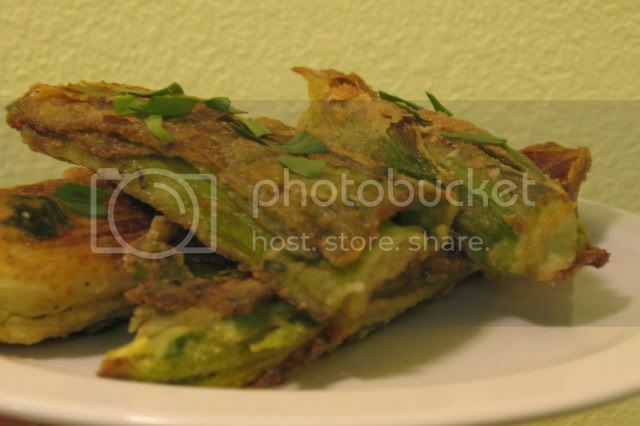 Delving further into the world of fried leeks, I made a gluten-free adaptation of a wonderful recipe by RecipeZaar user JenPo which is the feature of this post. I used my Rice Flour Mix as the flour for battering the leeks, but you should be able to use any gluten-free flour mixture that has a fine texture. The recipe calls for tarragon vinegar. You can find an easy recipe for making it at home here or you can buy a premade variety . If you don't have tarragon vinegar on hand, and don't have time to make it, try sprinkling the leeks lightly with chopped fresh tarragon and apple cider vinegar before serving. 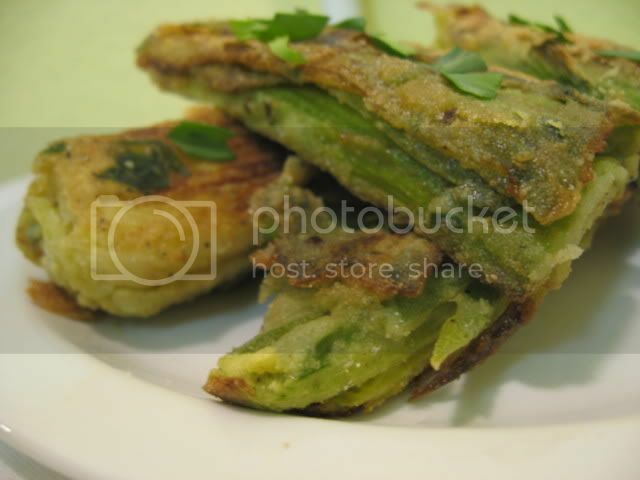 These fried leeks are wonderful - they are sweet and tender, and the batter creates a thin, crispy shell around them. This was my first time cooking with fresh tarragon, which gave me an opportunity to really understand and appreciate the fresh, anise-like taste of this herb. The vinegar was a surprisingly lovely finishing touch to this dish, which is intended to be served as a side dish. I was happy to discover that although they lose some of their crispness, these leeks re-heat well in the toaster oven so leftovers can be refrigerated for a day or two if necessary. This recipe is part of Weekend Herb Blogging, which is hosted this week by one of my favorite food bloggers, What Did You Eat? Trim leeks, removing the tougher and darker green part at the top. Slice in 1/2 lengthwise and rinse well to remove sand and dirt. Cut each leek half into 4-inch pieces and do not allow the layers of the leek to separate from eachother. Place in a steamer basket and steam for 10 minutes or until tender. Place on paper towel-lined plate and allow to cool for 20 minutes. Mince half of the tarragon finely and mix with flour, a generous amount of freshly ground pepper, and salt. Beat the eggs together in a separate bowl. Heat just enough oil to cover bottom of pan. When the oil is hot, coat the leeks in egg, then in the flour, and then fry until browned, turning frequently. Sprinkle with the tarragon vinegar (or apple cider vinegar) and the rest of the tarragon and serve hot. Thank you all so much for your wonderfully supportive comments to my last post. I am so grateful for all my wonderful readers, it's like having a personal cheerleading team! Meanwhile, I'm taking a break from the packing to post this powerfully flavorful quinoa dish I created for a friend's Passover seder. I was thrilled when several people told me it was the best quinoa they'd ever tasted - I think that my use of my extremely rich homemade vegetable broth combined with the toasting of the quinoa before cooking were a large part of its success. Use the most flavorful broth you have on hand, or try water and a gluten-free bouillon cube. 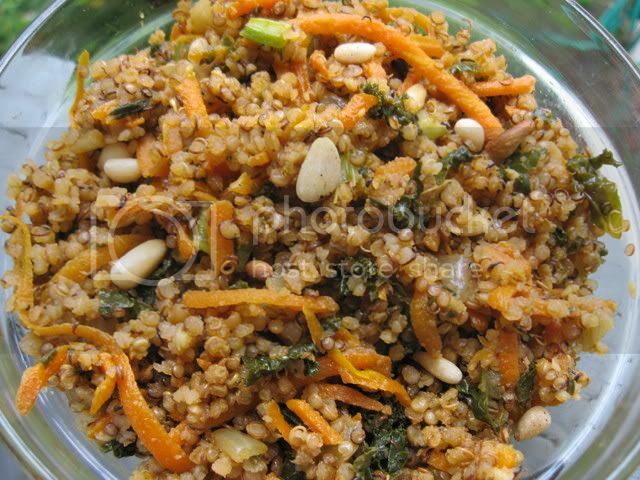 I enjoyed this pilaf at room temperature the next day as a quinoa salad - It makes a nutritionally balanced lunch for work or school, and will last at least a week in the refrigerator. If you purchased quinoa in bulk, rinse it thoroughly in a fine strainer to remove its bitter coating. If you purchased Ancient Grains, Trader Joe's, or any other boxed brand, no rinsing is necessary. Place quinoa in a heavy, large skillet over medium heat. Cook for about 15 minutes, shaking the pan frequently to move the quinoa around. Cook until the quinoa becomes golden brown. Remove from heat. Heat oil in the bottom of a medium saucepan. Add onions and sautee until just beginning to brown. Add garlic and cook for another 1-2 minutes. Add quinoa and sautee for a minute. Add all remaining ingredients except for celery and pine nuts. Bring to a boil, then cover and reduce heat to low. Simmer for 10 minutes. Add the celery and mix well, then cover and continue cooking for 5 minutes or until done. When quinoa is done, it should be tender and the spiral-like germ will have separated from the rest of the grain. In the dry skillet used for toasting the quinoa, now lightly toast pine nuts over medium-low heat. Pine nuts burn quickly so stir them frequently and remove them from the pan the moment they appear golden brown. Stir into pilaf before serving. Gluten-Free By The Bay is moving to New York ! On April 29th I will hop on a plane to New York. After 10 years away I'm returning to the town where I was raised, in the beautiful Hudson Valley. I will be temporarily staying with my folks while I get my feet on the ground in New York. My body is the main reason for this move - I have several chronic pain conditions which have been worsening from me working so much. This move will open many doors for me, including the possibility of working less and of going back to school. I will, G-d willing, be transitioning out of this life as a frazzled, financially stressed, overworked city-dwelling cook, to something healthier, happier and more sustainable. I'll miss the Bay Area like crazy - It's been my home for over 6 years. But I have a strong feeling that I'm making the right move. A bigger and better equipped kitchen. Better photos, thanks to being able to cook and take photos during the day when there is natural light available. More heart healthy recipes. I just learned that my triglycerides are high, and I will be cooking sometimes for my father who has very high cholesterol that he is successfully managing through diet, exercise, and nutritional supplements. So, you will be seeing many more low-cholesterol and lower fat dishes 'round these parts. A happier, more relaxed blogger... which is a very good thing indeed. As of right now I'm undecided about whether or not I need to rename my blog to reflect my new location, and possibly move it to a new URL. What are your thoughts? I fear this could cause me to lose much of my web traffic. I will make these decisions once I get to New York, since I have my hands full right now... so for the time being keep it tuned to the same station!